If you’re interested in the best of both worlds — an environmentally friendly hybrid with traditional sports car elements — consider the 2013 Honda CR-Z. With excellent fuel economy and other smart features, this compact wonder is a pleasure to drive. You can schedule a test drive in the new CR-Z at Middletown Honda at 520 Route 211 East in Middletown, NY, only a few minutes from Mechanicstown. If you’re still shopping around, then here are some facts to consider when comparing the 2013 CR-Z against one of its main competitors, the 2013 Scion tC. 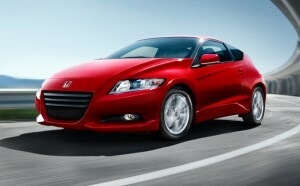 When it comes to saving some extra money and fuel, the 2013 Honda CR-Z is a cut above the tC model. With a manual transmission, the Honda coupe returns an EPA estimated* 31 mpg in the city and 38 mpg on the highway. The Scion falls well short, rated at 23 city and 31 highway. Such a wide gap in efficiency is significant, as it adds up week after week, for as long you own the car. What sets the CR-Z apart is that it draws on hybrid technologies to boost its fuel ratings. Regenerative brakes convert energy usually lost back into usable power, and the engine will automatically turn off when at a full stop to save on fuel. The tC, on the other hand, doesn’t offer either of these advances, which reflects in fuel economy. This Honda coupe comes with systems that drivers appreciate. For instance, the Hill Start Assist feature, which comes standard for the CR-Z, helps to prevent the vehicle from rolling backwards when starting on a steep slope. Such technology isn’t even available for the Scion tC. The CR-Z also has a standard feature called the Electronic Parking Assist, with a rearview camera that makes it easier to maneuver in tight spaces. Again, the Scion doesn’t offer such a system. One other point to consider is that there is plenty of room for your gear in the Honda, with 25.1 cubic feet of volume to offer you. The tC only allows for 14.7 cu. ft. When you look at all aspects of these two vehicles, and consider exactly what you’re getting, the choice becomes painfully clear. But, you don’t have to take our word for it — come down for a test drive! Whether you’re in nearby Mechanicstown or in a neighborhood much further away, it’s worth the trip to come test drive the new 2013 CR-Z at Middletown Honda. Come speak to one of our sales professionals to find out more details about this smart and fuel-efficient sports coupe! * Based on 2013 EPA mileage ratings. Use for comparison purposes only. Your actual mileage will vary depending on how you drive and maintain your vehicle.